The caravan of over 1000 Honduran “migrants” headed to the US continues to grow with no signs of being stopped by our “allies” south of the border. Fmr ICE Acting Director, Tom Homan, warns these caravans will happen every week if the dems take control of the House, as there will be no deterrence to stop them from illegally entering the US. Homan also makes an important point no one seems to want to address: If these “migrants” who are allegedly seeking refugee status are legit, then why haven’t they applied for asylum in Mexico? The democrats have been clear over how great and wonderful Mexico is, well if true why are these “migrants” headed to the US? 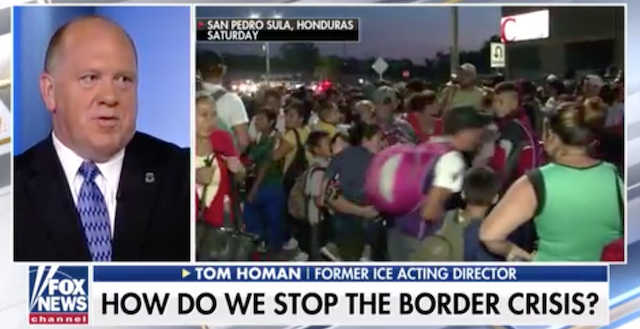 The border needs to be secured, the Wall must be built, and we need our immigration laws fixed, as Homan and Laura Ingraham argue. Yes, the GOP holds a slim majority, but it’s not enough when we have so many RINO’s infesting both Houses. The only way our immigration system gets fixed is to ELECTORALLY exterminate democrats from Congress, electing CONSERVATIVES in their place. As long as dems hold any degree of power to filibuster, bills to fix the problems on the border will never get through.